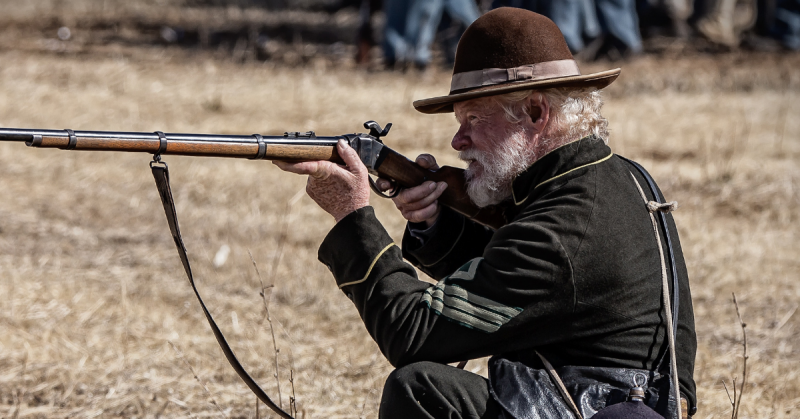 At Antietam—as with other Civil War battles—the most modern weaponry was employed, rifled muskets and long-range cannons that could lob a shell a mile distant. But the officers, both Union and Confederate, many of them West Point trained, were still in the sway of Napoleonic-era warfare, with its formality and rigidity. This became particularly evident during chain-of-command crises. Many of these occurred over the course of the battle. When a key officer went down, it shattered the command structure. The officer had to be replaced by his second in command, the third moved into the place of the second, and on down the line. In the heat of battle, crucial minutes ticked by as the command was reorganized. During the fighting in the notorious Bloody Lane, the Confederates experienced an epic rash of chain-of-command crises. The officer reshufflings that resulted, like something out of Keystone Cops, would be laughable if the consequences weren’t so dire. The Bloody Lane was an old dirt farm road, sunken by wagon traffic and erosion in some places to a level of four feet below the ground. One particular stretch, covering roughly 1,000 yards, was tight-packed with Confederates. They had torn up fencing and piled the rails in front of them, creating an impressive barrier. Holding this dirt road was critical; it represented the Confederate army’s center. 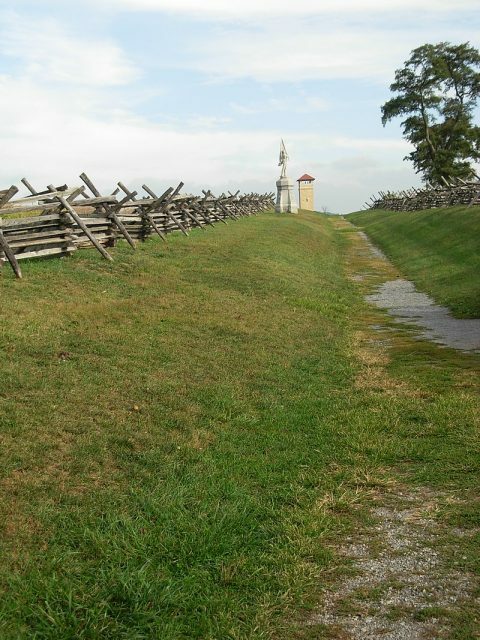 As the fighting heated up, Federal soldiers became adept at picking off Confederate officers in the sunken road. They were easily spotted, due to their uniforms and also due to the fact that, while infantrymen hunkered down, officers were always on the move, shouting commands, waving their swords. Presently, a Federal bullet found big quarry: Brigadier General George B. Anderson. It lodged in his ankle, and he was helped from the field. 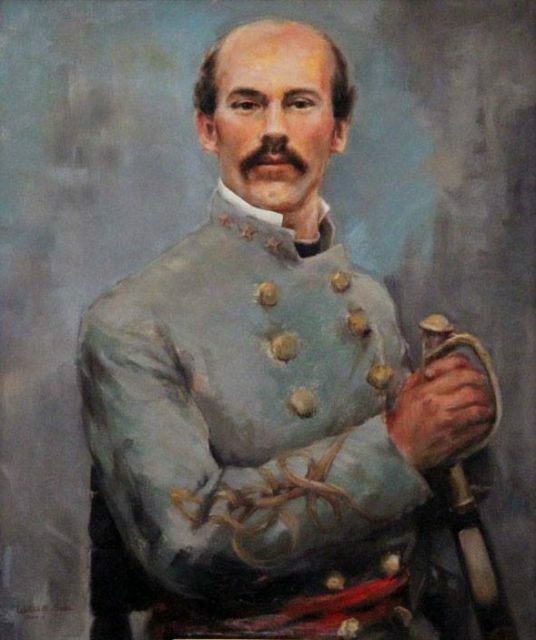 Confederate Brigadier General George Burgwyn Anderson was shot in the foot at Antietam. 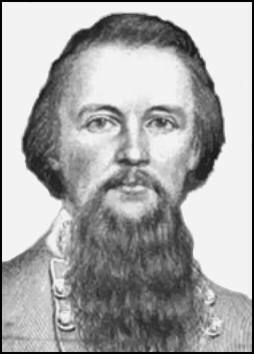 On October 17, 1862, exactly one month after the battle, he would die from the wound’s complications. After General Anderson went down, leadership devolved to his brigade’s ranking colonel. This was a man named Charles Tew. An adjutant scurried along the road until he found Tew, whereupon he informed the colonel that he was now in command. Protocol required that Tew acknowledge receipt of the message. As he rose ever so slightly and tipped his cap, a Federal bullet passed through Tew’s left temple and dislodged both his eyeballs from their sockets, before exiting his right temple. Colonel Tew had been in command for but a single senseless instant. Colonel Charles Courtenay Tew – Perhaps the shortest promotion before death as he was killed moments after learning of his new command. The shocked adjutant turned heel and set up the road the opposite way, searching out the next-in-hierarchy, Colonel Francis Parker. As soon as he delivered the message, the courier fell, wounded by a bullet. Moments later, a bullet grazed Colonel Parker’s skull. Blood streaming down his face, he staggered out of the road and made for the rear. Command now passed to Colonel R.T. Bennett. But then, just when things looked most dire, the Union soldiers halted their pursuit. They began drifting back over the farm, back across the sunken road. So what happened? What halted this potentially Confederacy ending rout? 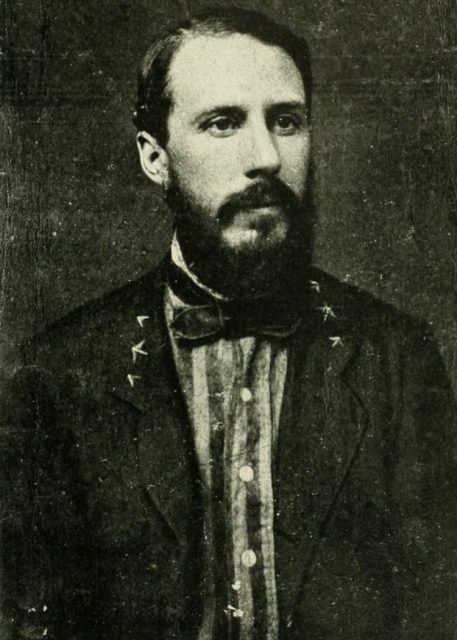 Turns out that Union Major General Israel B. Richardson had been struck by a fragment of shell that lodged in his shoulder, knocked him from his horse. 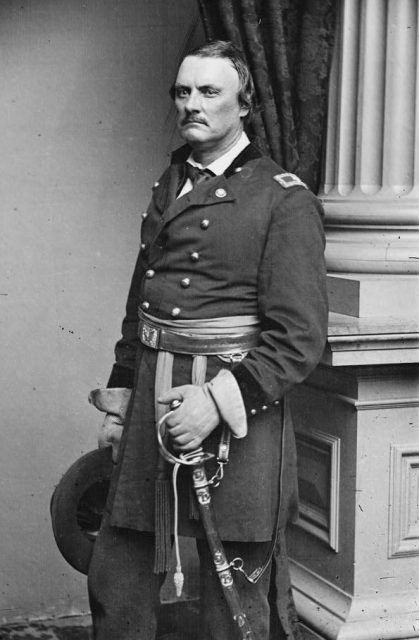 Union Major General Israel Richardson was struck by a shell fragment at Antietam. He was carried from the field and died on November 3, 1862. He had to be carried from the field, gravely wounded. This pitched the Union side into a chain-of-command crisis of its own. 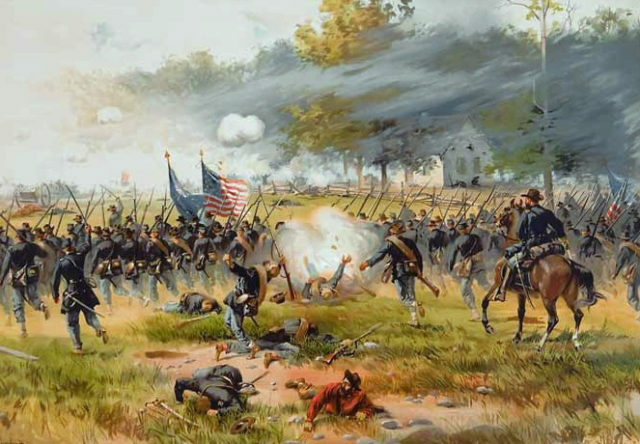 This is one in a series of posts, as guest blogger Justin Martin counts down to the September 17 anniversary of Antietam, still America’s bloodiest day. 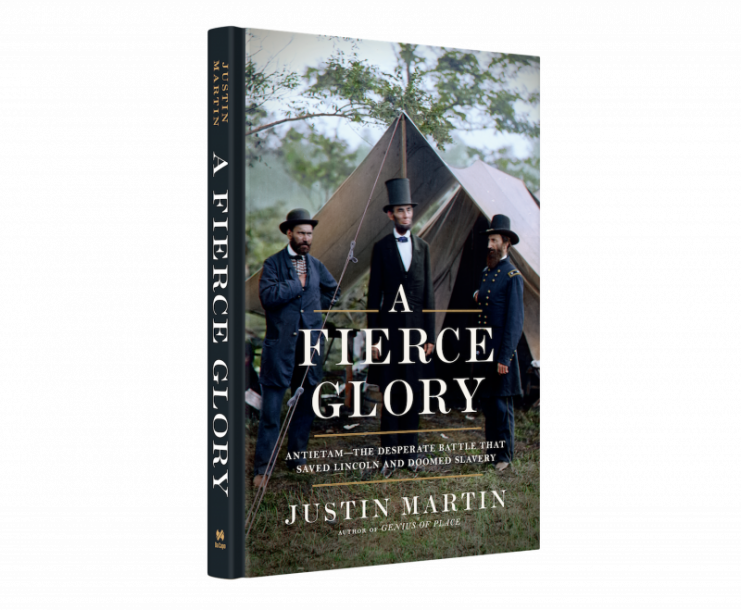 Martin’s posts will feature little-known episodes he learned about while researching his new book, A Fierce Glory: Antietam—The Desperate Battle That Saved Lincoln and Doomed Slavery (Da Capo Press). You can order the book here and here is Justin Martin’s website. Justin Martin will continue to share some special and insightful stories about the Battle of Antietam throughout the week. Please stop by tomorrow to catch the next installment.